We carry a full line of NEW heavy duty truck clutch kits for all makes and models this includes foreign trucks as well. We make sure all clutches are original equipment comparable and are designed for hard work. They all carry a one year 100,000 mile warranty. Brand names include Valeo, Lipe, Sachs, Daikin, Luk, Spicer etc. We can design a clutch to fit your needs. HR Clutch does all rebuilding of clutches on site. We follow the same quality and specifications of the original equipment manufacturer but at considerable cost savings. We can customize a clutch to how the vehicle is being used or who is operating the vehicle. With our forty years experience in the clutch business we have the knowledge and expertise to make sure the job is done right. We know the time that goes into installing a truck clutch and understand that doing the job twice is not an option. Clutches come in a variety of styles for heavy duty applications. There are single disc or double disc clutches with the materials mentioned below adhered to the surface. 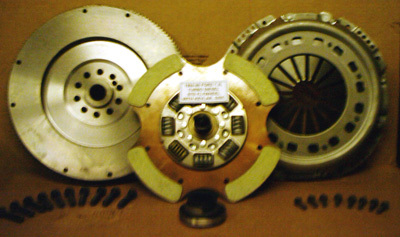 There are push-type as well pull-type styles of clutches. We can explain what you should have in your vehicle as well as the pros and cons of each. We have many options for our clutches. Heavier pressure plates and sometimes even lighter pressure plates along with upgraded materials such as ceramic or kevlar will definitely increase clutch life. Ceramic buttons are the industry standard with most of the heavy duty trucks on the road today. With trucks being overloaded and inexperienced drivers ceramic clutches stand up to to these extreme conditions. Another option is Kevlar which is not a new material on the market but it is not widely used, mostly due to the increased cost. However this material has many advantages. It stands up to extreme conditions but does not transfer heat generated from clutch engagement to the other component parts such as the flywheel or pressure plate. Heat is enemy number one which causes metal surfaces to warp and in turn causes the clutch to slip and soon after fail.